To celebrate the start of 2017, a slimming expert from Chesterfield is sharing her secret for successful slimming to help local people make their healthy New Year’s resolutions a reality. Two years ago as a busy working mum of two, Cathy could not bare to watch the scales keep creeping up anymore, "I found I used to wear large baggy clothes to hide my size" she shares. "After suffering a Slap Tear in my shoulder, it stopped me from attending my local gym and from doing the day to day chores, which caused even more weight gain." After attempting other diets with bad experiences of hair loss, Cathy decided to join her local Slimmimg World group on a Monday night. "Initially I was nervous and I did wonder if this was the right thing to do. But straight away I felt welcome and I had nothing to worry about. I found the people and the consultant to be so friendly." Cathy has learnt that the food optimising plan totally fitted in with her family and it allowed her to eat as much free food as she wanted. "I was amazed at the amount of food that I could enjoy AND lose weight. I love cooking my favourite meals like chicken tikka, quiche, chips and saving my 'syns' for my favourite treats like chocolate, crisps and wine - all guilt free !!!!!!" What made such a difference was the friendships Cathy made in group, "I love listening and sharing new ideas in group - the support is amazing and you never feel on your own or judged. In just 12 weeks, Cathy lost 1st 9lb and achieved her personal target weight, that she set herself, "I feel amazing, have lots more confidence and can even fit in my eighteen year old daughters clothes!" 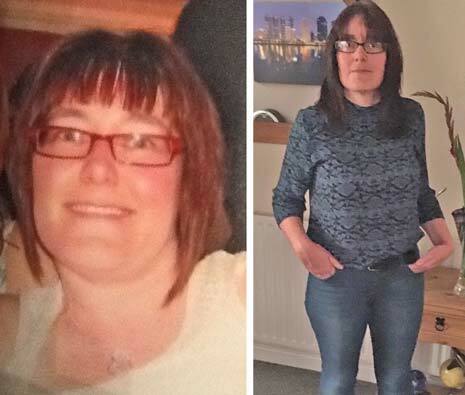 Cathy has also kept at her target weight for the last 14 months, "I could not have achieved this without all the support of the group and my consultant - joining that night was the best thing I could have done." Cathy is now launching her own brand new Slimming World group at Doe Lea Resource Centre on Monday 2nd January at 7:30pm. She said, "I can't wait to help people believe in themselves, to help them to lose weight and to achieve their dreams." Everyone is welcome, for further details please call Cathy on 07766 650264.